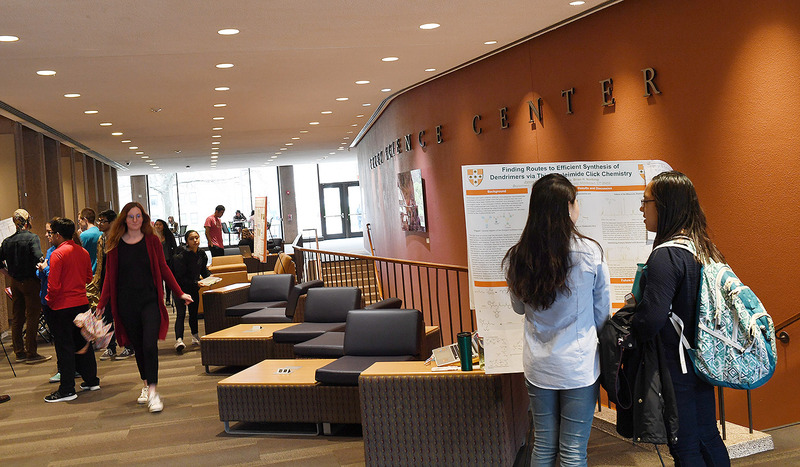 Honors and MA students from the Natural Sciences and Mathematics Division participated in the Celebration of Science Theses, April 27 in Exley Science Center. 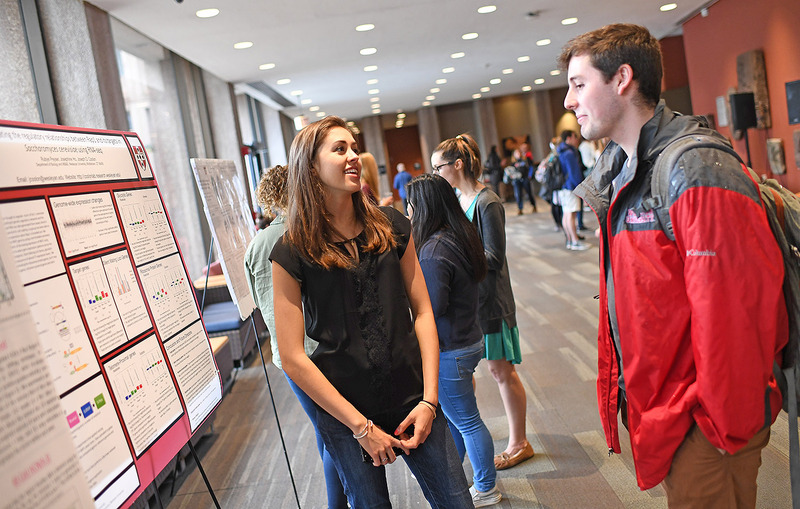 Students shared their work with the broader Wesleyan community. 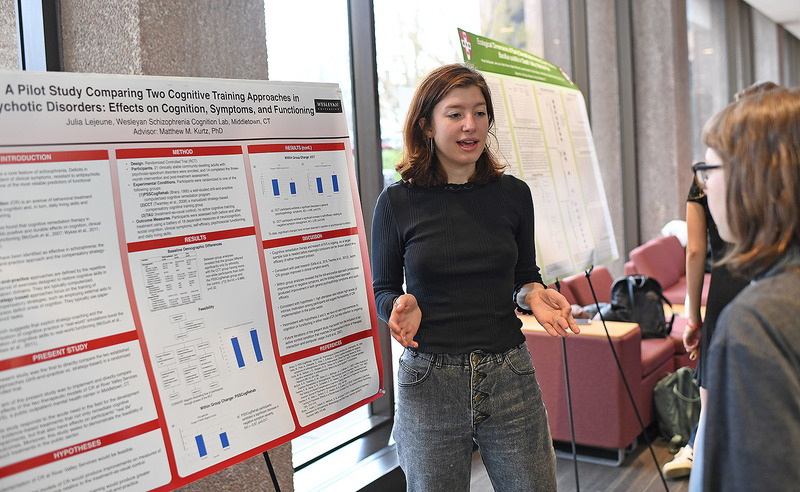 Darci Collins ’18 presented her research titled “Lord Kelvin’s Error? An Investigation into the Isotropic Helocoid.” Collins’s advisor is Greg Voth, chair and professor of physics. 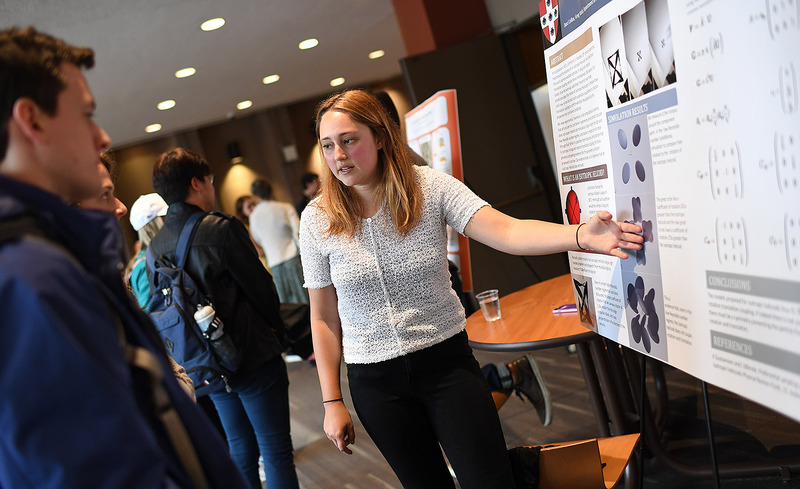 Rubye Peyser ’18 presented “Investigating the Regulatory Relationship between Rap1 and Its Targets in Saccharomyces cerevisiae using RNA-seq.” Peyser’s advisor is Joe Coolon, assistant professor of biology. 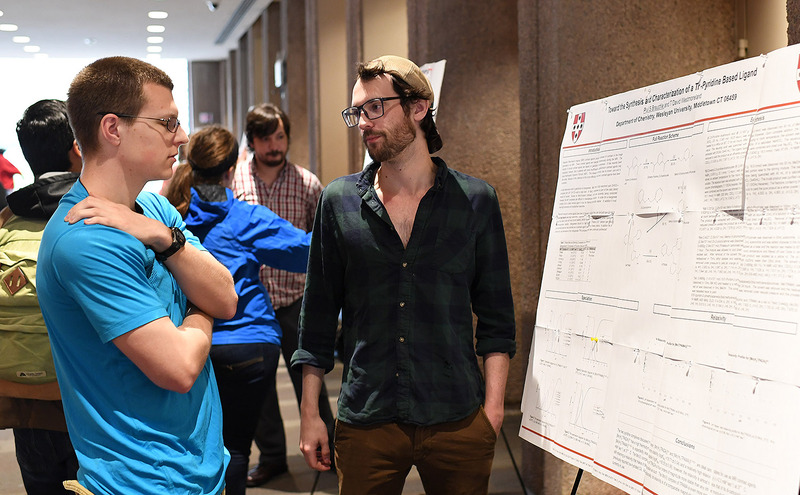 Chemistry graduate student Paul Brauchle ’17, at right, presented “Toward the Synthesis and Characterization of a Tr-Pyridine Based Ligand.” Brauchle’s advisor is T. David Westmoreland, chair and associate professor of chemistry. 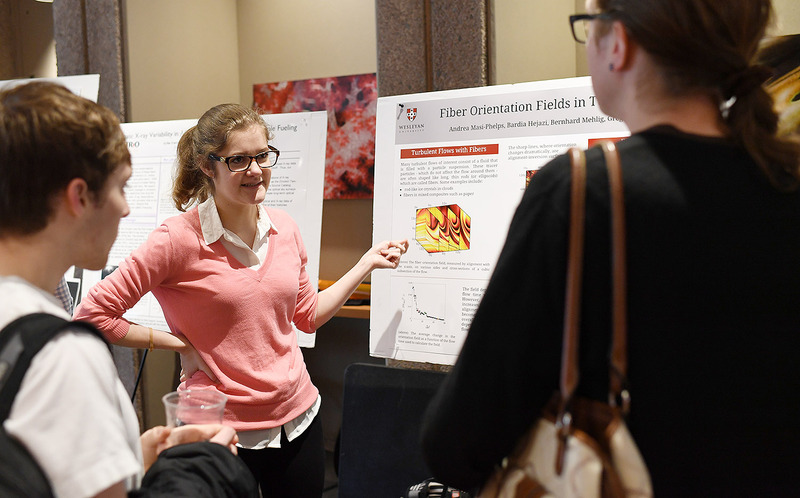 Andrea Masi-Phelps ’18 shared her research titled “Fiber Orientation Fields in Turbulence.” Her advisor is Greg Voth. 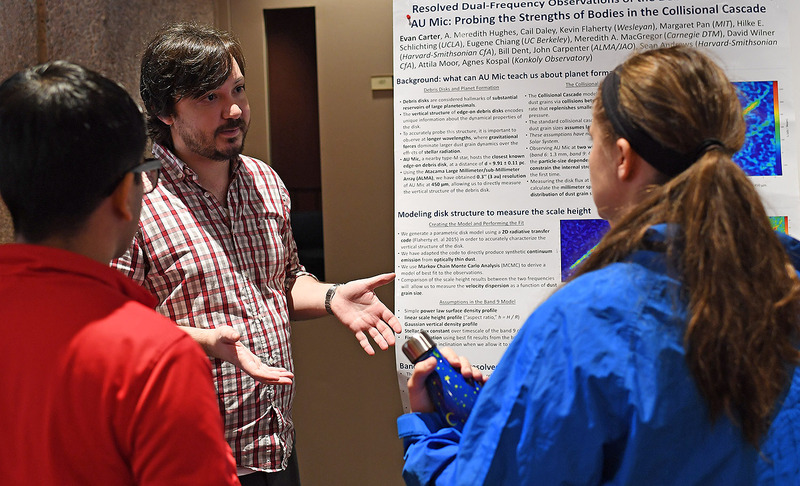 Astronomy graduate student Evan Carter presented his study titled “Resolved Dual-Frequency Observations of the Debris Disk around AU Mic: Probing the Strengths of Bodies in the Collisional Cascade.” Carter’s advisor is Meredith Hughes, assistant professor of astronomy.